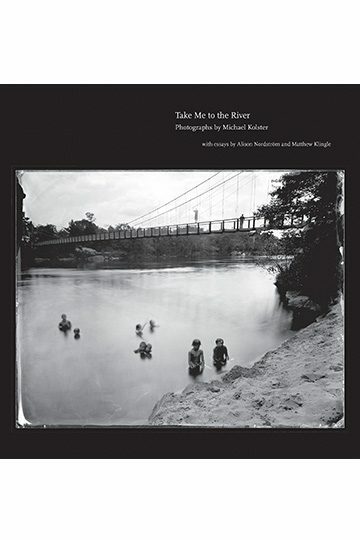 In Take Me to the River, Michael Kolster explores four American rivers that flow into the Atlantic Ocean—the Androscoggin, Schuylkill, James, and Savannah—as they emerge from two centuries of industrial use and neglect. Even as these well-known rivers still carry the legacies of longstanding pollution in their currents and sediments, thanks to the Clean Water Act of 1972, they have become renewed and rediscovered waterways that our grandparents never could have envisioned. Kolster’s new book is a masterful presentation of dramatic yet understated photographs of these rivers, from their source to the sea. In the spirit of nineteenth-century photographers such as Louis Daguerre, Henry Talbot Fox, and Timothy O’Sullivan, they were made using the wet-plate photographic process, in a portable darkroom Kolster set up along the banks and overlooks of these rivers. The chemical slurries that develop and fix the image on the glass plate actually mimic the movements of a river’s current, and the idiosyncratic qualities of Kolster’s ambrotypes harken back to the historical coincidence of the dawn of photography and the industrialization of Europe and America. With the reality of a changing global climate and consensus building about the extent that humans are responsible, Take Me to the River challenges us to set aside our blinders of wanting to see these riverine landscapes as either pure or despoiled. As the boundaries between the human and the natural are increasingly entangled, Kolster’s photographs suggest how we can embrace, even cherish, places once degraded and ignored that have become, in their own way, alluring.